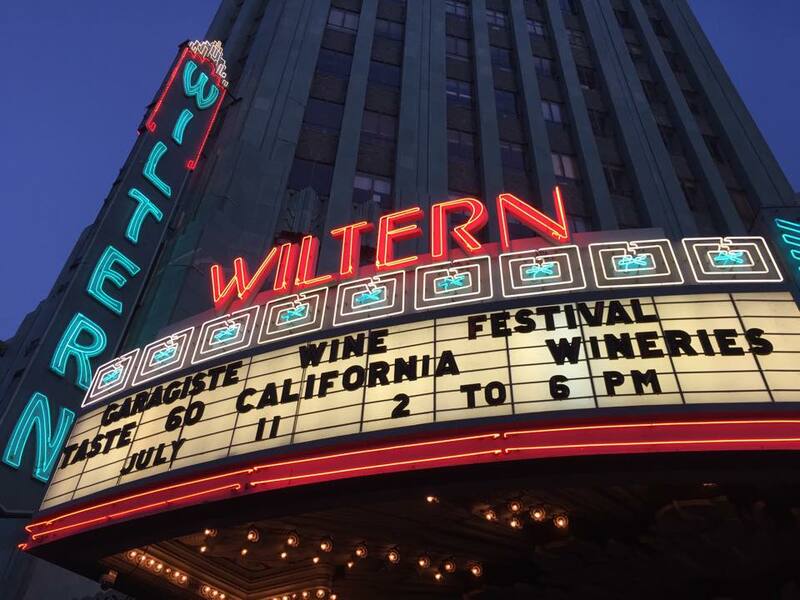 The first time Doug Minnick, co-founder with Stewart McLennan of the Garagiste Festivals, told me the Wiltern was going to host the latest version of the event, I was a little concerned. Were they just going to use the stage? If not, what about all the seats? Well, it turned out the seats are removable and the entire venue became “the stage” for the wineries to showcase their latest releases – and more! When you think about it, the Wiltern does make sense from a poetic point of view. Not only did Doug have a long career in music production, but the Wiltern has had many legendary acts perform on its stage and now presents many “indie” rockers on a regular basis. And the Garagistes, with their small production and hands-on / no rules style of winemaking, are certainly the indie rockers of the wine world. As with many wine festivals, there were two levels of ticket pricing. And also as usual, the VIP level was well worth the additional cost. Not only did you get in early, but there was an added bonus as most of the wineries also poured for the VIP attendees their “Rare & Reserve” selections – a combination of older vintages as well as unleased barrel samples. Eve has already reported on the Rare & Reserve wines (West Ranch Beacon 7/24/15) so I focused on tasting as many full winery lineups as I could do justice to. And while I visited barely a third of the winery tables, these are the wines that made the biggest impression on me – note that the wines listed are the ones I liked the most at the tables I managed to visit. The tables were set up alphabetically, but I wasn’t sorry to see Maggie Tillman of Alta Colina. Been a fan of her family’s wines since Doug Minnick introduced me to them a few years ago. The Block 2 Bio Syrah was my wine of the day. I’ve been hearing a lot of good things about the wines being made by brothers David and William Vondrasek. Glad I finally got to taste them. I’ve already tasted winemaker Lora Marie Taylor’s Chardonnay and Pinot Noir. I was excited to taste the new vintage Chardonnay barrel sample but even more impressed by her early, non-commercial Sangiovese. I can’t wait until she releases a Bellissimo Cellars Sangio. Owners Scott and Andrea Williams’ wines were delicious and elegant when I tasted them at Family Winemakers a few months back. I didn’t taste everything at their table this time, but I did enjoy their latest Rose, finally got to taste their dessert wine and was impressed how the GSM was showing with a little more time in the bottle. I first reported on Matt Villard’s wines in early 2014, so it was nice to catch up a little. Matt has since moved from the cooperative tasting room he was at in the southern end of Paso and now has his own tasting room in Morro Bay. Pretty sweet digs for a pretty great winemaker. I’m a fan of his red blends, while my wife Karen loved the perfume of the Viognier. I’ve been familiar with the Kick Ranch vineyard due to my fondness for Morgan Twain-Peterson’s Bedrock wines, as he has used this vineyard, among many others. I was sad to hear that Morgan won’t be using Kick Ranch fruit anymore, but glad to have a new source for wine from this property – the owners themselves. Especially love the dark brooding 2010 Petite Sirah. SCV residents Nate Hasper and Steve Lemley continue to source great Paso Robles fruit for their wines. I love that they are bringing attention to lesser known grapes like Tannat. I was first introduced to Shai Cellars by Goddess of Wine Denise Lowe, and there she was pouring alongside Shawn Shai Halahmy. Really did a great job with that Grenache, an absolute steal at $24 per bottle. Winemaker JP French was his usual charming self. The Stanger wines always have a little extra age on them, and it really shows in how well the blends integrate. The friend helping the owner of Overland Wines suggested we be sure to visit his daughter-in-law at TLO. We were planning to anyway, but this was just a little more incentive. His daughter –in-law Avery is director of marketing for TLO and daughter of founder/winemaker Andy Zaninovich. To me, William Allen epitomizes the garagiste movement. He makes the wines he wants in the style he wants, primarily Rhones. I was most impressed with his whites, especially the Grenache Gris and Trousseau Gris, varietals I had not had before. I’ve been following winemaker Mark Wasserman since I first tasted his wines a couple years ago. Especially liked the Mezzanotte, a blend of Petite Sirah and Primitivo. Always nice to see Jennifer and Victor Abascal. First tasted their wines at an event several years ago on the Queen Mary, which I just found out was the first event they had poured at. Still great people turning out stylish wines. And I love that the last wine I am listing has a rock and roll theme.